An air raid has started and Crichton (Clive Francis) rushes to the Chelsea home of Alison with a marriage licence (Awyne Place/Alwyne Road) after getting leave unexpectedly. Crichton rushes into the house (31 Alwyne Road) and lets himself in. Decades later Mr. Barrett (Larry Noble) helps Jon Holden move into the house that he has rented. A woman covers the windows of her shop with blackout shutters and nearby pub (The Baring) is evacuated as an air raid is announced by the sound of sirens and the drone of aircraft engines. After deciding to rent a new house Jon Holden (Robert Lansing) takes Kit Beaumont (Gabrielle Drake) shopping to celebrate. 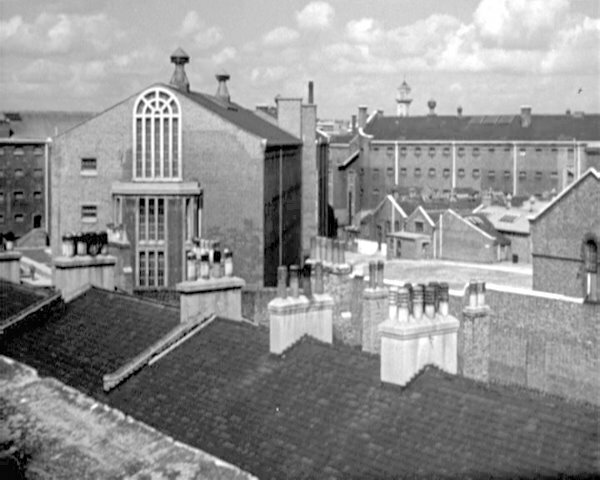 Drake is sent to interview Prof. Nadia Sandor in prison (H.M. Prison Pentonville). Craig Sterling sent to watch Paul Westerman in Birch Hill Prison (H.M. Prison Pentonville) posing as a fellow prisoner. Simon drives Dunstan to the back of Eileen Ballinger’s home as they suspect Farnberg might be there. After leaving Camden Passage Jon Holden (Robert Lansing) and Kit Beaumont (Gabrielle Drake) rush to catch a bus. The bullion delivery arrives at Kings Cross Station and is picked up by the security van. Ronald Lacey (Jerry Blake) and his gang Lefty (Patrick Durkin) and Cowboy (James Chase) pay a visit to a local barbers shop to demand protection. The barber, Tony Mazzo (Will Stampe) runs out of the shop after being attacked. 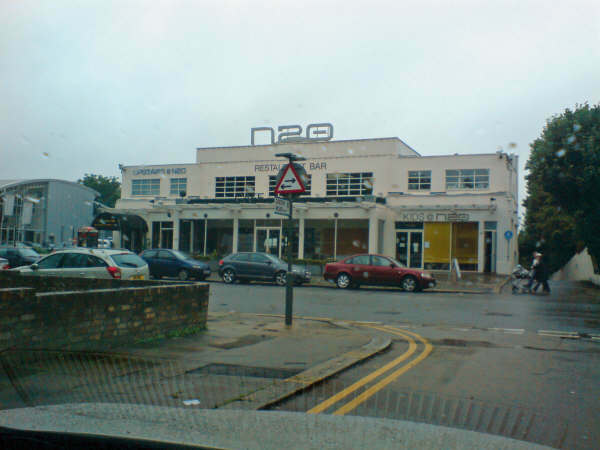 Simon Templar buys some rockets from a corner shop (totally redeveloped, from the phone book Certainly there was an R. Collings Chemists at No.3 Popham Road and a Barley Mow pub at 31). The prison van approaches the ambush and soon The prison van is almost at the ambush corner. Booker and Sarah arrive outside the prison. They are signalled from inside the prison and warned about Steriling’s presence. Later Richard Barrett drives to his position outside the prison (Wheelwright Street looking towards Roman Way). The peace of a quite Chelsea square is broken by the sound of air raid sirens. Spender Todd (Patrick Allen) and Jimmy Casey (Patrick Bedford) arrive at the home of the Danes (Dane Court, 60 The Bishops Avenue) and proceed to break in. A policeman is cycling by and takes the number of Casey’s stolen car. The policemen arrive and are able to arrest Casey whilst Todd escapes. Steed arrives at the home of Professor Witney (East Weald) in his yellow Rolls. 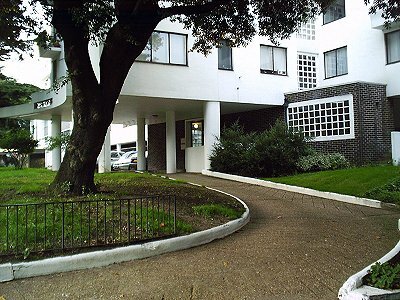 The Carroway and Grant Garage (redeveloped as retirement flats called Mulberry Court) where Cathy Bellman (Nicola Padget) goes looking for clues to her sister’s whereabouts. 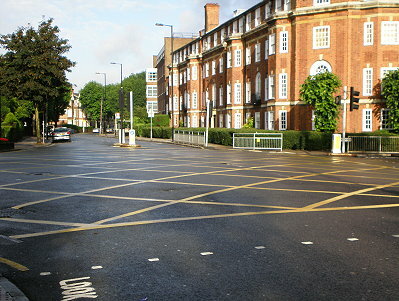 After being fobbed off she sees Eric Little (James Culliford) driving away and flags down a passing taxi to follow him. Simon chases after the two crooks, Anworth and Fasson, in his Volvo. They start to fire at him from their car (Holne Chase turning into Rowan Walk). Eddie Black follows Wilfred Garniman’s car after it leaves Deverest’s house (turning into Holne Chase). After finding that they have left the theatre tickets behind Simon does a U-turn (at the Norrice Lea roundabout) to return back to the house with Gabriel. 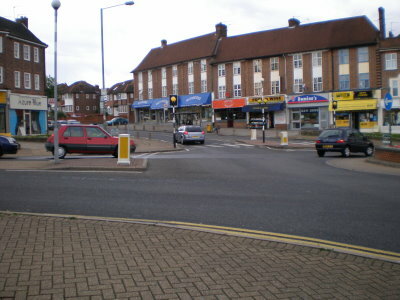 After the two crooks drive off from Gabriel’s house Simon gives chase (along Winnington Road to the Norrice Lea roundabout and up Norrice Lea). Simon has to give up the chase when his tyres are shot out and he watches Anworth and Fasson drive away. 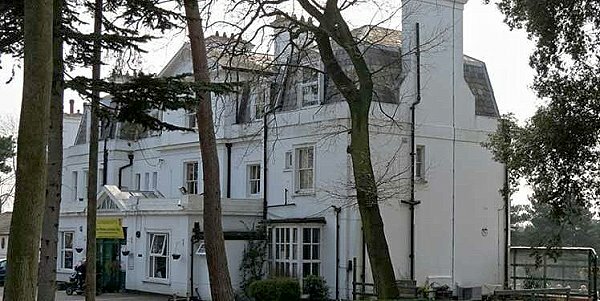 Mr Booker’s rrives at his house (17 Winnington Road) and enters. Later, following up on Pickering’s information Richard (William Gaunt) drives to Booker’s house (between Winnington Close and Norrice Lea).Richard see’s Garcia’s car. As he approaches the house he senses that Craig is in trouble inside. Annabelle and Stuart arrive at the house (12 Winnington Road) set up for Ralph, Albert and Spenser by Dr. George Kent. A liitle later Dr. Kent arrives and sees Stewart’s car. Todd arrives back at his flat and leaves as Spender. 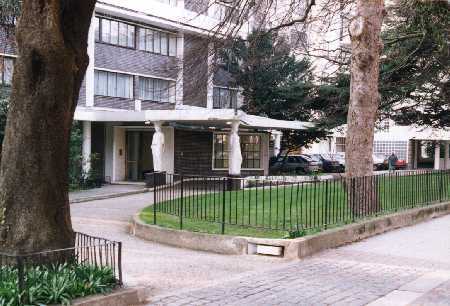 “Highfield Court near The Angel”. Sandra Casey (Jean Marsh) takes a taxi to Todd’s flat. She tells the taxi river (Richard Davies) to wait whilst she talks to the janitor (George Merrit). Fortunately Todd (Patrick Allen) is just leaving. Sandra gets back into the taxi and they follow Todd’s car. Franco (Michael Wynne) drives Simon Templar to Tony Allard's apartment block in Rome. While they are there, they are attacked by two villains who then make their escape through the lobby and across the car park. Later Claudia Molinelli (Suzanne Lloyd) arrives at the apartment block to pick up Tony's diary. Simon Templar arrives in his Volvo at the flat of Mary Bannerman (Jan Waters). He is just in time to see Mary leave with Jeff Peterson (Mike Pratt). The Saint delivers Jean Lane to her apartment in his Volvo. Sir George Collins (Patrick Newell) leaves his home. Scudder (Mark Jones) meets Sir Charles Engleton (Basil Dignam) to discuss the appearance of Harry Rule at IMA. They are observed and photographed by Paul (Tony Anholt). Later Scudder arrives with details of the selling price and Engleton drives away with the information in his Rolls Royce. 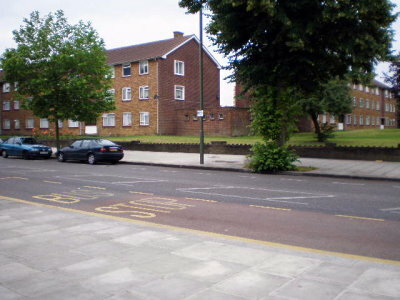 Robert Fuller (Peter Jeson) leaves his flat and gets on a bus (134 Pimlico) and is followed by Drake in his Mini (between Holmesdale Road on the left and Cholmeley Park). Later Drake returns to take Fuller in for questioning. 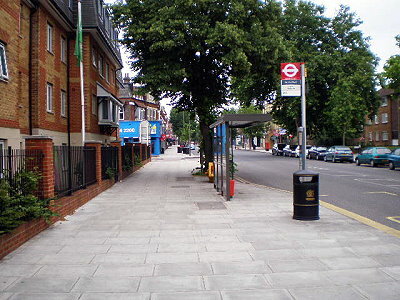 Robert Fuller arrives at his destination on the bus (134 Pimlico) and opens the Citizen’s Advice Bureau (opposite Waterlow Road and the spires at the right hand corner of the photo are part of the Whittington Hospital complex. 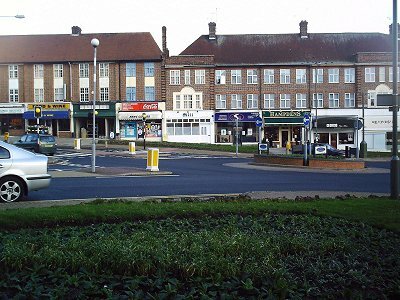 All the buildings on the left were demolished for the dual carriageway). Sits in his Mini watching a flat at 75 Baron’s Street, the house of courier Kathleen Mary Martin (Kathleen Breck). After talking to base he gets administration to drop off a suitcase in case he has to take a trip. When Martin leaves the house he follows. 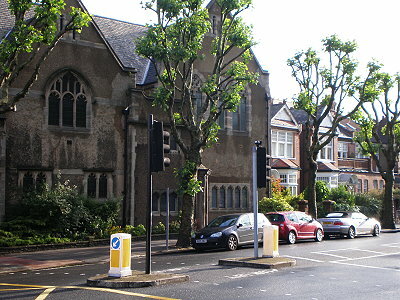 Raymond Huntley follows Asano and Samantha back to their home (Hampstead Lane going into Courtenay Avenue). The Baron visits Asano the following day to ask about his role in Japanese prison camps. Later Huntley breaks into the house and kills Asano. As he leaves he is seen by Yasugi. 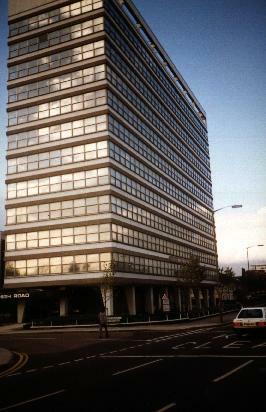 A mysterious figure with razor-sharp claws stalks the offices of Simon Roberts before starting to scale the side of the building with deadly intent. The funeral of Ralph Madison is well attended. Inga Madison (Barbara Bel Geddes) is joined by her boss, Sir Gerald Walters (Richard Vernon) and her assistant Barbara Rossiter (Sue Lloyd). As they return to their cars they are observed by insurance investigator Adam Frost (Jack Hedley). Jimmy Wilson (Bob Sherman) drops Christine Hansen (Diane Keen) off at a cemetery in his TR7. Christine walks into the cemetery where she meets Forbes (Stephan Chase) and Sir Charles (Geoffrey Keen). On the trail of the girl who shot him, Harry Rule arrives at Jordan’s Hotel in his yellow MGB and drives down to the underground car park. Professor Alexander Schelpin skulks in his hotel room. Later Harry and Paul arrive looking for the Professor, but he has already left. Later still Harry decides to search the hotel once more. Private investigator Frederick Shea (Aubrey Morris,) arranges to meet Insurance investigator, Adam Frost (Jack Hedley), at a London square. Shea offers Frost the file containing his report on the activities of Inga Madison in return for future remuneration. Gideon and David Keen leave the Copthorne’s home after asking about possible blackmailers. A police constable guards the gates of the cemetery as the body of Leah Anne Borgman is disinterred by the police. Simon drives his Volvo to meet with Friste at his warehouse 12a Manning’s Wharf, E14 (redeveloped). Later Major John Dunstan arrives just in the nick of time in Simon’s Volvo and rescues Simon from Friste and Farnberg (they drive past The Albion pub as they drive away). 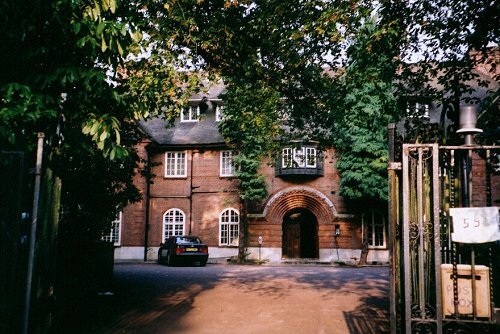 Establishing footage of HMP Holloway, Parkhurst Road (old frontage since redeveloped). "Islington, London, May 12th" - An estate agent takes his client to see a warehouse property (viewed from Caledonian Road junction). The barber, Tony Mazzo (Will Stampe) runs over to The Angel Club to see Frank Romano. Later Weasel (Louis Mansi) waits on the street corner for Browning and Keen. Weasel is picked up in a police car by Browning and Keen (at the junction of Crescent Street and Offord Road). Jeffrey Conaught's men force Templar's car of the road (Junction of Barrington and Abbeville Road), whilst Conaught (Anton Rogers) talks to Templar (Ian Ogilvy). The Coroner's court where the inquest in to Charlie Stewart’s death is taking place (Hornsey Coroner’s Court). Cathy Bellman follows Eric Little’s Sunbeam Alpine in a taxi, but the traffic lights at the junction (with Tetherdown) foil her attempt. After Cathy Bellman’s taxi is stopped at the light Eric Little’s Sunbeam Alpine carries on down Queen’s Avenue. Steed and Lovejoy attend the 'funeral' of Mrs. Peel - NEEDS CONFIRMATION. The sexton (Victor Platt) watches as a funeral of Dr. Marlowe comes to an end in Pringby churchyard. After he finishes filling in the grave a small aerial ascends unnoticed from the ground. Later Steed (Patrick Macnee) visits the churchyard in to investigate and finds out from the sexton the Dr. Marlowe has just been exhumed by the undertakers. Steed gives chase in his vintage Vauxhall. John Mannering and David attend Jim Carey's funeral. Helga (Patricia Haines), Charlie (Nosher Powell) and Owen Davies (Artro Morris) pay their respects also. Frank Nicholls (J.G.Devlin) and a local reporter break into a secret laboratory concealed beneath a Welsh churchyard. Richard Barrett meets up with Nicholls in the crypt of the church after dodging armed patrols. Squires (Bernard Lee) and Yeats (Philip Locke) lead their men in an attack on the church. Jeff (Mike Pratt) drives through the gates of the cemetery where Marty (Kenneth Cope) is about to be exorcised by Purley (Charles Lloyd Pack) under the instructions of Hellingworth (John Fraser) and Carol (Alexandra Bastedo). A fight breaks out and Inspector Large (Ivor Dean) turns up to arrest the criminals. Jeff (Mike Pratt) and Marty (Kenneth Cope) go to investigate the previous night's occurrences at Marty's grave and are met by Jeannie (Annette André); they go the the gate house. Later Jeff is attacked by Harper (Geoffrey Hughes) and is picked up by Mandrake (George Murcell). Young Harry Mandrake (Nigel Terry) is taken by Dighton (Bernard Kay) and Harper from the tunnel after escaping from the house; next morning Marty and Jeff investigate. Stuart and Jason set off from the hospital to race across London at night to Post Office Station to save Annabelle. Jeff drives back to the office in his Vauxhall. A train enters a surface tunnel on the London Underground (Piccadilly Line between Southgate and Oakwood). Alan Cambell-Gore (Davis Collings) contemplates suicide and climbs onto a road bridge (ArchwayBridge). He is interrupted by a couple and rushes away. George Unwin (Barrie Ingham) leaves the Offices of Unwin Enterprises and is threatened by Shelton (Simon Oats) in his car. As Unwin leaves Steed arrives in his Bentley. Steed (Patrick Macnee) is taken by Taxi to meet Dunbar at the offices of Intercrime. Later Steed and the rest of the Intercrime representatives are taken by Dunbar (Keith Baxter) and Fuller (Edward Brayshaw) in a mini bus to engaged in The Crime of the Century. Later Tara (Linda Thorson) escapes from the offices in the same mini bus. 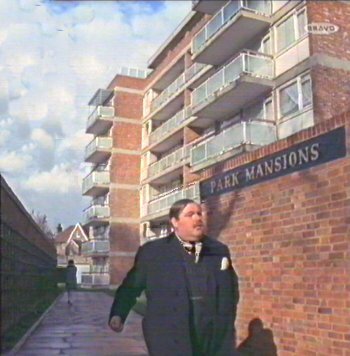 General Platt (Laurence Naismith) follows The Gent (Christopher Timothy), in his Mini, back to his suburban home (Corner of Friern Barnet Lane and St James Close). After Simon swerves his Volvo around a series of London streets he quickly drives into the repair shop of roadside garage (1105-1111 High Road),. He and Janice Dixon watch as Swann and Miller’s car drives past. They then leave to continue their journey unobserved. 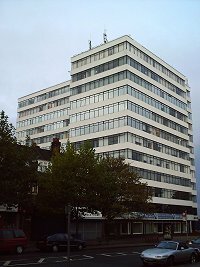 Simon Templar and Queen Adana arrive at the Schweizer National Bank (1255 High Road), and later depart followed by the villains. 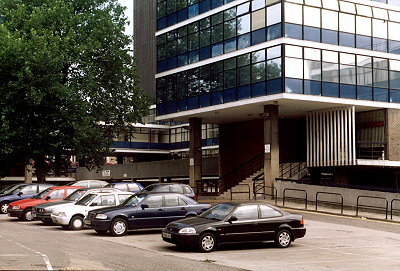 The Baron and Cordelia make their way to the Jensen in The Ministry of Justice car park (Northway House) and are followed as they leave by a red Citroen. 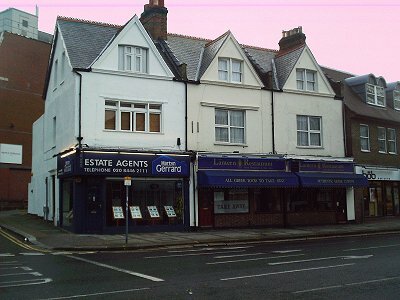 1255 High Road, with appropriate optical printing of background, appears as Nemesis HQ in various establishing shots. 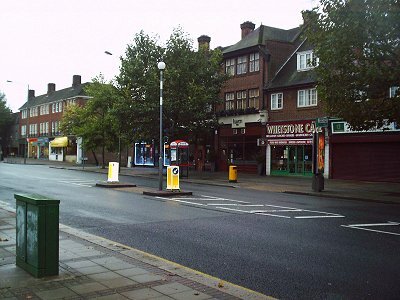 The Contessa follows Smith's car in a taxi as he leaves the studios and heads out of town towards the country. General Platt (Laurence Naismith) confronts Robbie (Kim Fortune) at The Lantern Coffee Shop. He chases the young boy round the back of the shop and gives him a hiding. Mannering is taken to Hospital after his car crash. Johnny and Rhys break into the hospital in an attempt to finish what they started. 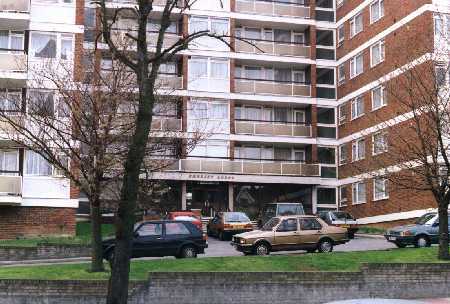 Christine and Jimmy return to Jimmy Wilson's flat at Barrydene Mansions. Forbes (Stephen Chase) catches Christine Hansen (Diane Keen) a she leaves the flat. Later Simon Templar (Ian Ogilvy) and Jerry (Mary Tamm) arrive in Simon's car. Simon leaves in order to lure a watching man (Chris Dillinger) away and in the process meets a girl in a negligee (Cheryl Gilham). John Drake visit Peter Jones’ home village and talks to a clergyman in the churchyard. Richardson (Peter Arne) shows Janet Wells (Catherine Woodville), John Drake (Patrick McGoohan) and James Randall (Glyn Owen) around the church (St. Andrew's Church) where Alan Bayliss is buried. Richardson takes the opportunity to tell Janet that she will be filling Bayliss' position. Warlock's car drives past Long Pond as he takes Simon to visit Hermetico. John Steed arrives in his Bentley at High Pines (Totteridge Park, Totteridge Common), Eddington to interview Hunt, the solicitor, Dr. Armstrong's lawyer. Unfortunately Bronson (Frederick Jaeger) is already there with a cybernaut. Jeff drops Fay Cracken off at her hotel, The Orange Tree public house. Jeff's car follows Hellingworth's car to Marty's graveyard and passes the gates of Pembury. Tara (Linda Thorson) is taken by Major Firth (John Cairney), Jill (Kathja Wyeth) and Lieutenant Barrett (Mike Lewin) to the church where Mother's funeral is taking place (St. Andrew's Church). John Drake visit the television station (Alexander Palace transmitter mast) to talk to his contact Kassawari.